Notations is a platform for the creation, performance and promotion of collaborative work between visual and sound artists, composers, designers, dancers, based on alternative scores/notations. Notations throws Calls for participation to collaborative projects through the year & Gatherings for try-outs / presentations by its members - with often a special guest. Notations is associated to the Notations21 project by Theresa Sauer. Arthuur is a performance and a work in progress, a dance-music-visual meeting in improvisation, where the instant happening on the stage materializes on three levels – by sound, movement and drawn line. This project was created in collaboration between two dancers: Kateřina Dietzová [CZ/NL] & Manuela Tessi [IT/NL], two graphic designers: Deimion van der Sloot [NL] & Hidde Meulenbeek [NL] and two musicians: George Cremaschi (US/CZ), Petr Vrba (CZ). At Kulter, all musicians are invited to join the improvisation. 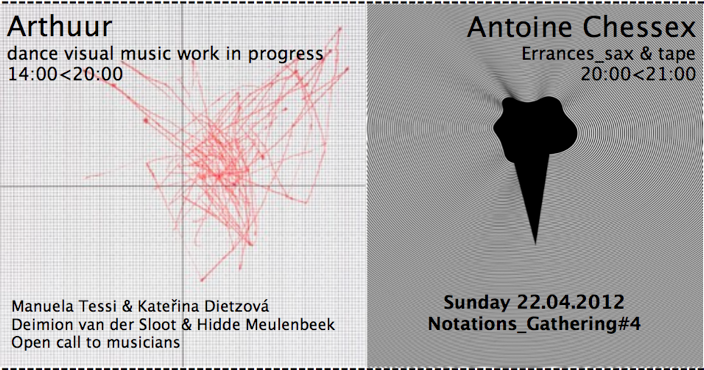 Among the participants: Alfredo Genovesi [UK, NL - guitar and electronics], Kim Josephine Bode [DE/NL - recorders]. This search is framed by short time chapters given by graphic designers according to when they change sheet of paper in the Arthuur-machine and in this way start a new chapter. Each movement-music chapter has its own registration, which is displayed for the audience to have a look and in the end creates a small exhibition. Arthuur develops, by his own will, rather as a site-specific project; he likes to react on different environments and architectural and spatial definition. Antoine Chessex is a composer and sound artist born in 1980 in Vevey, Switzerland, with a background as a saxophone player and performer. His sonic researches include compositions for ensembles, solo works, transdisciplinary collaborations and sound installations. Chessex´s works are based on the exploration of the physicality of sounds and spaces. His solo works feature dense layers of sustained pitches reacting with the architecture of the space or massive clouds of amplified sax resulting in intense live actions in total immersion in the sound. Antoine Chessex is touring in London, Berlin, Paris and Brussels in April with a new piece: Errances, based on long sustained textures played in real time melting with their sonic shadows on tape thus creating immersive clusters of microtonal beatings resonating in the space.